Memory limits - 64-bit system can only use 4GB of RAM memory - PC Buyer Beware! Memory limits – Why can my 64-bit Windows 10 PC only use 4GB of RAM memory? Note that a 32-bit operating system (Windows, Linux, OS X, etc.) cannot use more than around 3.2GB of memory. Therefore, it is pointless installing more than 4GB. A 64-bit operating system can use as much memory as the motherboard supports. With regard to RAM memory limits, to keep costs down, the manufacturer’s of current budget desktop and laptop PCs only install the minimum amount of memory that is necessary to make a 64-bit version of Windows 10 Home or Pro run properly. Since most new computers come with a 64-bit version of Windows 10, that amount is usually 4GB, the minimum amount of memory that a 64-bit operating system needs to function properly. Made up of four 1GB DIMM modules fitted into the four slots of a desktop PC’s motherboard and two 2GB SODIMM modules fitted into the two slots of a laptop’s motherboard. The memory slots of both recent desktop and laptop PCs can almost always accept modules of a higher capacity than 1GB (Desktop) and 2GB (laptop) modules. Old laptops that came with a 32-bit version of Windows, dating back to Windows XP, usually have two memory slots that can only accept memory modules of 1GB. If your desktop PC has four 1GB memory modules installed in four memory slots on its motherboard – 4GB – and you want to double it to 8GB, you will have to replace all of the 1GB modules with 2GB modules. Or you could replace two of the 1GB modules with 2GB modules to get a total of 6GB. Or you could replace just one of the 1GB modules with a 4GB module to get 7GB. But to do that the motherboard must support those particular configurations, which may or may not be the case. Also, note that desktop and laptop motherboards can be very finicky about the memory they will run. Even memory of the same specifications – type, speed, buffered, unbuffered, etc. – might work if made by one manufacturer and might not work if made by another manufacturer. That is why memory is sold in kits. Moreover, due to changes in the manufacturing process or technological improvements, new memory of exactly the same specifications and made by the same manufacturer as older memory might not work on a particular make/model of motherboard. Memory compatible with the computer’s motherboard, made by two (or more) manufacturers, might work, or it might not. To make sure that a memory upgrade works, I use the Crucial Advisor tool on crucial.com to get the right memory for a make/model of computer or motherboard and buy the memory in a kit. I replace all of the current memory with the memory in a kit and sell the old memory on eBay. I have never had to return any memory using that method. Anyhow, Crucial guarantees memory that its Advisor tool or System Scanner recommends or your money back. Once it is working it usually just keeps working. RAM memory modules almost always come in even-numbered quantities – 2GB, 4GB, 8GB, and 16GB. 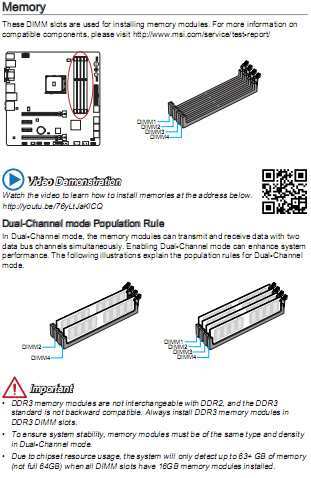 This is because the faster multi-channel memory modes – dual-channel and quad-channel modes – that run two or four modules as if they were a single module, require two or four modules of the same type and capacity to function. The PC motherboard’s user manual provides the information on how to achieve multi-channel operation. For more information on this topic on this site read: Multi-channel memory architecture: Dual-channel DDR3 and quad-channel DDR4 memory. Modules of 128GB are available, but no home or even office user is ever going to need that much memory and certainly won’t pay more for it than the cost of the PC in need of an upgrade. The main factors that limit the amount of memory a PC can use are the power required to run the modules, the heat given off by them, the number, type, capacities of modules that the computer’s motherboard can support and the UEFI/BIOS support. If new memory is not working, you should check the computer’s motherboard manufacturer’s website for the latest UEFI/BIOS update and install it if it is not already installed. The brand-name manufacturers of desktop and laptop PC almost always provide user and often service manuals for their models. The user manual or service manual for a particular make/model provides information on the different types and configuration capacities of memory modules that the computer’s motherboard supports. The manufacturers of the motherboards of desktop PCs provide user manuals from their websites that provide component and UEFI/BIOS information and component installation information. The memory information includes the types and capacities of the memory that the motherboard supports and the configuration in which it can be installed. For example, if the motherboard supports DDR4 memory, the capacities and configurations of DDR4 modules that can be installed in the DIMM memory slots. With regard to RAM memory limits, in theory, a 64-bit system can address and use an astronomical 18 million terabytes (TB) or 18 billion gigabytes (GB) of RAM memory. A 32-bit system can only address about 3.5GB. Installing more than 4GB on a PC using a 32-bit operating system is therefore a waste of money, no doubt adding unnecessary overhead that slows the PC down. Read the following post that deals with a PC that has 4GB of RAM installed but uses less. February 19, 2017 in PC Problems and Solutions, RAM Memory Problems.